Beautiful, sleek and eye-catching – we love this Retail POS Display by Evian. These words are all things that are associated with the Evian branding, and so it shouldn’t be surprising that their POS Display Units have a similar feel. We particularly like this design as it stands out without being overpowering. Retail POS Displays Units are a great way to visually advertise your product. They also give you an opportunity to get your brand name out there. 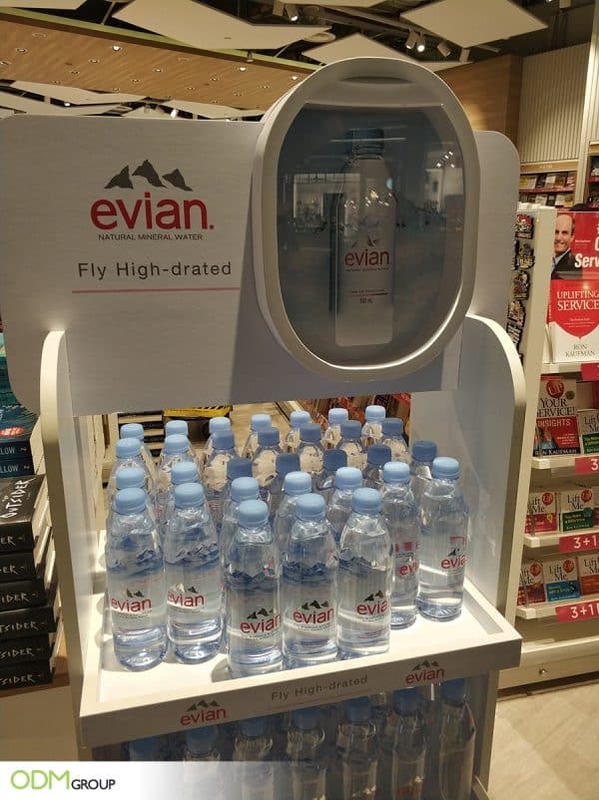 Spotted at an airport, Evian have made the most of their opportunity here. The brand name in imprinted on it with a picture of the mountains and the tag-line ‘Fly High-Drated’. 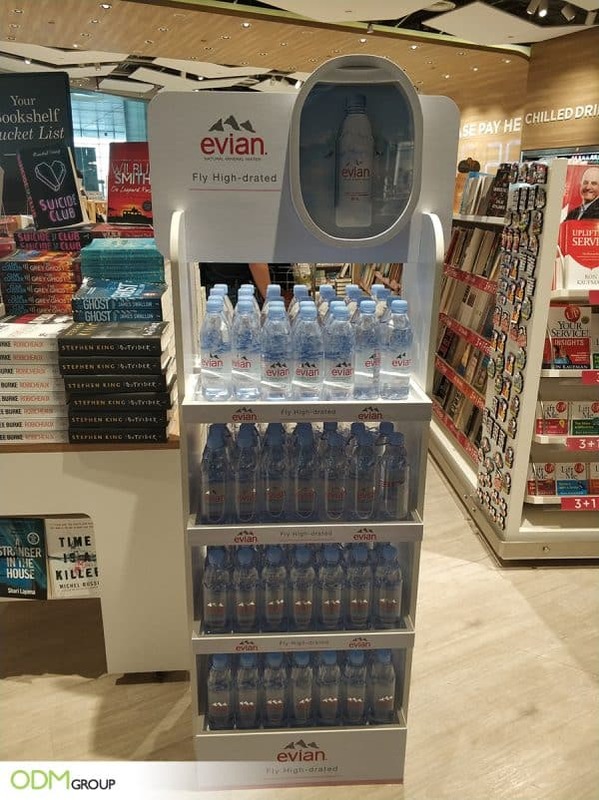 This clever take on words will make customers smile and also remind them to remain hydrated when flying. This free standing display unit is evidence that simplicity works best to get your message across. Especially for a brand that is globally famous. Evian has already got a name for itself, so its main priority is to uphold its existing brand reputation. The colours here are pure, natural and fresh. The customer will consequently think of the water product with the same connotations. This is a really well thought out display that certainly has serious design appeal. This charging station design is another cool example of a well designed free-standing display unit. This sophisticated Evian display reminded us of the Johnnie Walker Chinese New Year Display Units. Indeed, when done correctly, these are a great method of enticing the customer towards your product. Upholds Brand Reputation: Evian is sourcing its water from the south shore of Lake Geneva. Clients know this brand as a sophisticated, high-end brand of water. It’s marketing and design team has done a great job of making this Retail POS Display give off the same feel. High Quality: A well known brand such as Evian will have a large marketing budget. This certainly has helped to improve the quality of this display. Look at this blog to see high quality branded products. 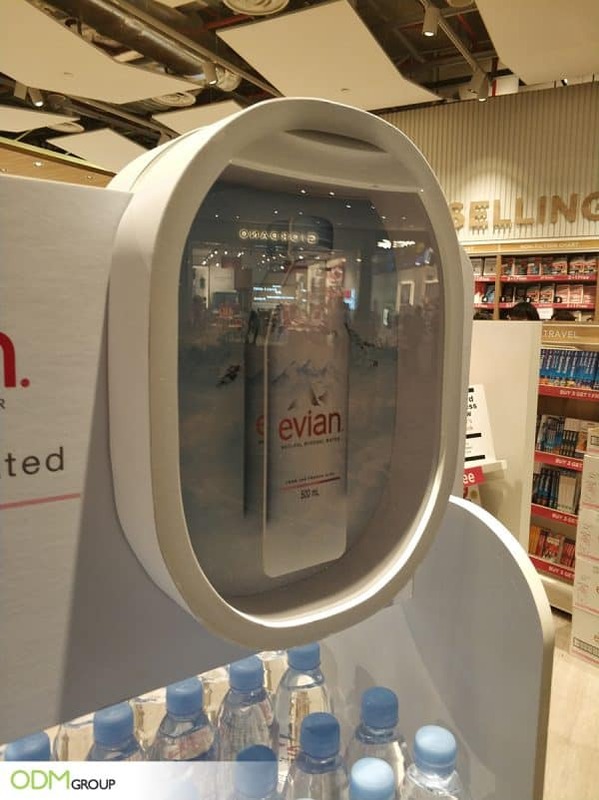 Brand Logo is Well Placed: The 2D pop-out enlarged Evian bottle at the top of the retail POS display enhances brand visibility and looks really nice. Unique but Effective: This is a unique POS Display but an effective one. It will sticks in the customers mind due to its appealing look. Terefore this will help to increase brand remembrance. Could your company benefit from a retail POS display? As we have seen they are a great method to grab customer attention and bring them over to your product. If you think this is for you then we’d love to hear from you! Please get in touch with one of our team today. We can design and manufacture to your exact desire.